The new information on Clinton came from her physician, Dr. Lisa Bardack, who both wrote the letter about her health last year and was the doctor who diagnosed Clinton with pneumonia on Friday. The release also included a one-page letter pronouncing vice presidential nominee Tim Kaine “in overall excellent health” from Dr. Brian P. Monahan, the attending physician in Congress. The new information from Bardack, Clinton’s doctor, further addressed her pneumonia diagnosis from last week. Bardack said in the letter that she’s examined Clinton multiple times since then, as recently as Wednesday. 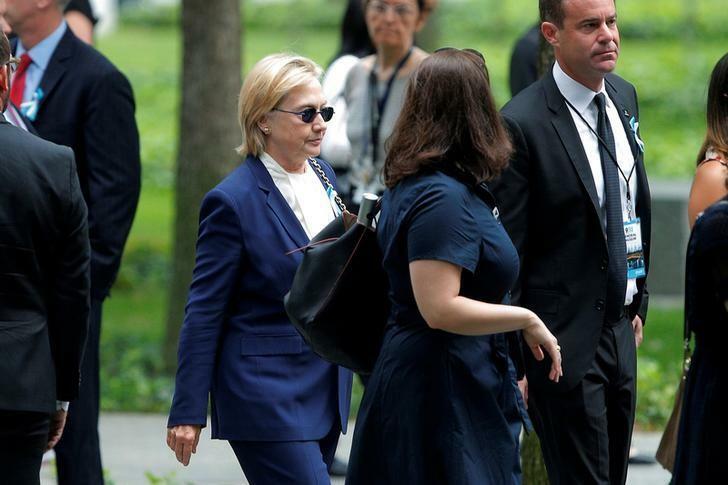 Clinton’s health has been front and center since Sunday, when she abruptly left a 9/11 memorial ceremony in New York after feeling “overheated” and “dizzy.” Clinton went to her daughter’s apartment in Manhattan to recover before returning home to Chappaqua, N.Y.; later that evening, her campaign revealed that she had been diagnosed with pneumonia the preceding Friday. According to Bardack’s letter, she saw Clinton on Sept. 2 for a low-grade fever, congestion and fatigue. Bardack advised rest; Clinton continued her campaign trail travel, and a week later—last Friday—she saw Bardack again when her symptoms had worsened. On Friday, Clinton underwent a non-contrast chest CT scan, which showed a “a small right middlelobe pneumonia,” according to Bardack, which she characterized as a “mild, non-contagious bacterial pneumonia. Clinton was treated with Levaquin, which she was advised to take for 10 days. In addition to her pneumonia diagnosis, Clinton has been treated this year for a sinus and ear infection she developed in January. In order to drain fluid from her left ear and relieve her symptoms, Clinton had a myringotomy tube placed in her ear in January by an ear, nose and throat (ENT) doctor; her symptoms have since abated, according to Bardack. Bardack’s letter included an updated list of Clinton’s medications, which include Levaquin, Armor Thyroid, Coumadin, Clarinex and B-12 as needed. Her vaccinations are up to date, and she has had a normal mammogram and breast ultrasound. Clinton’s blood pressure at her last examination was 100/70 and her temperature was 97.8 degrees. As for Kaine, Dr. Monahan pronounced him in “overall excellent health”—his only recommendation was that the vice-presidential candidate add a daily vitamin D supplement to his diet.